I've mentioned on Twitter how I've opened a few bottles from the cellar this weekend that were over the hill. One I'd bought years ago, a half bottle of '96 Chateau d'Epire Savennieres, so long ago it came from the original Berkeley Bowl before the move from the (in fact) converted bowling alley to its now decade-plus conventional home. Others included Winebid purchases that will go unmentioned. Let's just say that I've had some amazing successes buying at online auction. These weren't those. However, I'm confident in my passive wine cellar. Here's the 1998 Prieuré St. Jean de Bebian Coteaux du Languedoc, gorgeous after nearly a decade in my unheated, uncooled Portland basement. This wine has a story for me however. Bebian was the wine I mentioned so innocently online about a decade ago, while I worked for the importer. We'd discounted the $30 price to $10 in the shop with the 1997 vintage. We were up front that the quality wasn't as good as usual. That's the nature of vintage wine. It's not always the same in profile or quality. Surely a $10 price suggested as much. Yet I was unwise enough to mention that price cut on the internets, bringing down the wrath of the owner who said they didn't want the price published. Ah, the days before the internet was understood. This was public information, but not that public. I was kind of pissed off then, and confused. Now I understand, but the whole thing still seems futile. It wasn't like the internet wasn't around in 2000. Word got out about things, even then. But I digress. Prieuré St. Jean de Bebian Coteaux du Languedoc is a southern France property planted to the thirteen varieties of Chateauneuf du Pape, the grenache, syrah and mourvedre most of us know along with so many other varieites for red and white wine. The grenache cuttings apparently come from Rayas, the syrah from Chave, the mourvedre from Tempier in Bandol, recent syrah plantings from Beaucastel. This is a serious property, for sure. I was introduced to the property by my friend Paul P. who brought an older bottling to a dinner in San Francisco many years ago. That wine, vintage forgotten, seemed red fruited and Chateauneuf-like. Since then, my experiences with the producer have been about darker fruits and a profile as if Chateauneuf were from the northern Rhone. More focused, pure and defined than that behemoth southern Rhone wine often is. This 1998 follows that pattern. I wouldn't guess this to be either southern Rhone (typically grenache-based) or northern Rhone (typically syrah). Rather, it's southern France, the Languedoc or Midi. Just highly nuanced and unusual for this region that still produces mostly common wines along with the occasional glossy, too big for its britches beverage. No, this is deep, dark, rich but restrained, focused and intense like few Languedoc reds ever are. It's clean too. No need for rogue yeast to provide earthy qualities here. And the iodine, near to the sea quality of the Languedoc isn't overdone, where you think you're drinking olive brine with the smoke of burning rosemary branches. This '08 Bebian is all about an aromatic balance of ripe fruit, warm stones, olives, brushy herbs like rosemary and sage, and sea air. Upon first opening, there was a distinct ash note that I find in many Oregon pinot noirs. 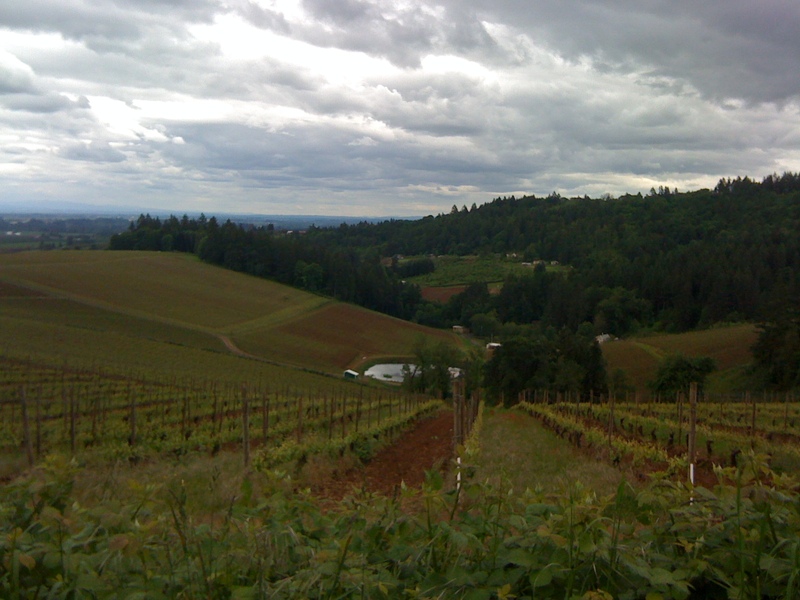 People sometimes refer to "Oregon garrigue" when noting local wines, and that must be what they're finding. Here we're talking about the real thing, southern French herb and soil scents that provide such a nice savory quality to the sweet ripeness of the wine. In the mouth, this wine is still finely tannic though more approachable than it was younger. I like way the drying tannin balances the sweet fruit of the wine, especially with grilled lamb at dinner where the meat brought out the wine's fruitiness. As a whole, this is beautiful wine. Aging wonderfully. Full of promise with a few more years of cellar time, as the tannins continue to soften and the sweetness of age emerges. This is why we cellar wine, no matter the occasional disappointments. And let's just say, this isn't the 1997. This is really, really good. Four incredibly busy days later, I'm still reflecting the glow of last Sunday's Vincent garage tasting. It marked the end of home winemaking. I'm happy to announce that just today I received final approval for the Vincent Wine Company winery license. It seems fitting to finish the garage project in pictures like memories. The 2008 Vincent Pinot Noir, Zenith Vineyard. Me pouring for wine conspirator and friend, Anne Hubatch. Home cured pork from Portland Charcuterie Project. Lonzino from PCP. Oh my god. PCP pickles on our Bauer plate. A wine garage, but still a garage. Jennifer prettied the place up with Gerber daisies. Last of the homemade wine. Big thanks to Todd Merkel of Portland Charcuterie Project for the delicious home cured meats and pickles. Todd's doing incredible work for the love of food. And thanks especially to Joshua Chang of PDXploration for the gorgeous photography and permission to use his work here on élevage . In the aftermath of the Garage Tasting, I blew off my real job and hung out with friends from Seattle who came down for the shindig. 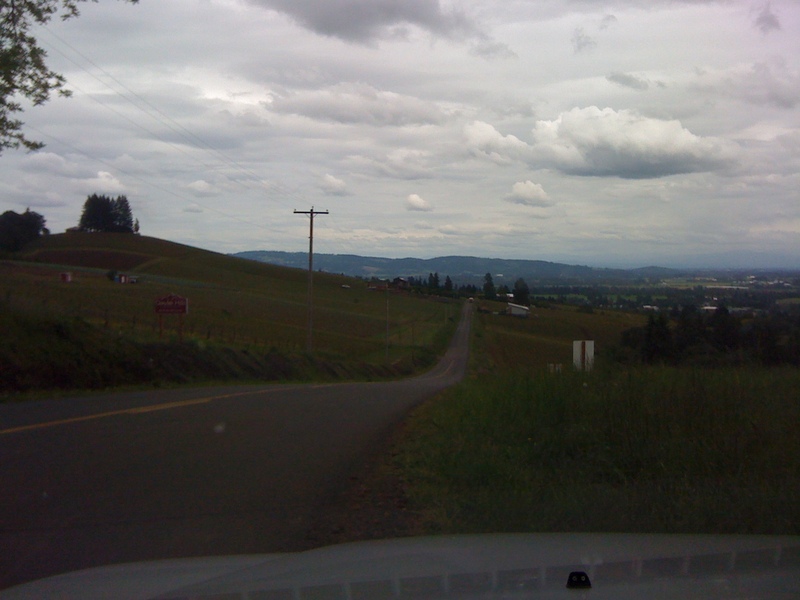 Then I shipped some wine to various people and took advantage of the drive down to Yamhill county to visit Ribbon Ridge and the Armstrong vineyard. This new planting will be my primary source for grapes in 2010 and beyond. I'm really excited, so I took some more pictures (earlier post here). The spring weather here in western Oregon is still rotten. We had some nice days around my birthday earlier in the month, thank heavens. My mother was visiting and I was so glad she was able to enjoy the incredible flowers all over Portland in bright but still mild sunshine. Since then we're back to constnt gray and serious (for this time of year, anyway) cold. Would you believe highs in the low 50s for a few days? Indeed, the heat made an encore performance. I'm hoping it's off again until we fight the urge come October. Nevertheless, the vineyard looks great. Young vines are vigorous so there was much more growth here than comparable sites I saw driving around the Chehalem Mountains and Dundee Hills with older vines. Hail has been frequent this spring but there's little hail damage. My hydrangeas look terrible, but the vines seem unaffected. Check out those leaves and primordial grape clusters. This still young vineyard has waited three long years to produce fruit. We're just about there. 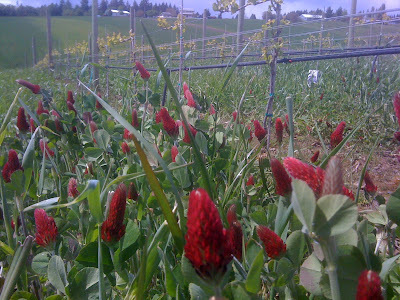 Since my last visit, the cover crop in the rows has been plowed under. Even with all the rain, the soil here drains pretty well so mud wasn't an issue. You can see nice consistent growth in this block of pinot vines, all 115 clone on the southern end of the vineyard looking uphill to the north. If you look closely you can see the mostly vertical shoots growing up between the trellis wires. Those that stray get put into place. All in all, things look terrific at Armstrong. I'll be back again and again charting the parogress of the season, getting to know the vines and vineyard before seeing the fruit in the winery. On the way home, I headed over Worden Hill Road through the heart of the Dundee Hills. 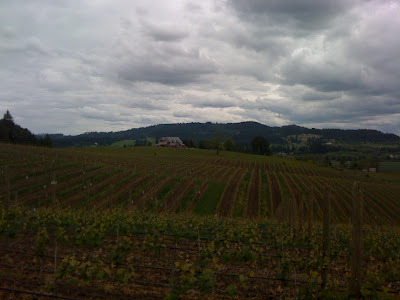 This is where is all began for Oregon pinot back in the '60s and '70s. Here's a bad shot from the car down Worden Hill from Maresh. Le Pavillon and Prince Hill on the left, Winderlea on the right. Down the road I stopped like a tourist to take his shot looking due south from Winderlea to the west facing slope of Weber above and the lower part of the Arcus bowl around the pond and first clump of trees. They don't call these parts the Red Hills of Dundee for nothing. And even with the lousy weather, the sky is mesmerizing. Wow. Our 3rd annual garage wine tasting yesterday was the biggest and best yet. Sixty to 70 adults, maybe more. I stopped counting after Jennifer and I washed dozens of the used wine glasses as newcomers kept arriving. I had 36 to start with but that clearly wasn't enough. Lots of kids too, which is always great. My own kids have helped punch down, press and bottle my homemade wines, so of course we like kids around. I'll post a complete review of the event, along with excellent pictures from PDXploration that you can see in collage by clicking that link. For now, my own shot of a 4-year old Martin pressing the 2007 Vincent Pinot Noir Meredith Mitchell Vineyard on the driveway nearly three years ago. He was really into it, and while I won't let him operate the mechanical press at the winery for a long time, it might come sooner than I think. This is what it's all about. The Vincent Garage Wine Tasting this Sunday is almost upon us. To recap, I'm pouring my final homemade wine, my 2008 Vincent Pinot Noir Zenith Vineyard. Then we'll try some barrel samples of 2009s that will be bottled and released later this year. And I'll pour some older homemade wines to check in on them, plus some bubbly and maybe something else. We'll see how things go. Right now, there are about 60 people confirmed, including several élevage readers whom I'm looking forward to meeting. We'll have at least one retailer, a few winemakers, at least one vineyard owner, the graphic designer who's working on my label, homemade charcuterie from a local blogger and élevage reader, and a whole bunch of friends, aquaintences, kids and who knows who else. One thing is clear - this final garage tasting will be the biggest yet and I'm sure the most fun. We even have past attendees coming from Seattle because they don't want to miss it. That's crazy, but definitely good crazy. If you're interested, email me at vincent . fritzsche [at] gmail . com. Of course take out the spaces and put in the @. I've give you the address. When you get here, we'll be up the driveway in and around the garage. I'll be out there from noon to 5pm. See you there. Stoller vineyard is a large, well regarded site for pinot noir on a far southwest knoll of Oregon's Dundee Hills AVA. It's so large that, in addition to estate production, many producers buy from the vineyard, with some producing Stoller vineyard designated bottlings. Perhaps the most well known of those bottlings is from Chehalem, but buyers over the years have included Scott Paul, La Bete, Boedecker and Adelsheim, among many others. 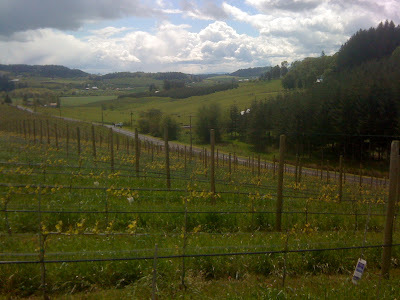 Stoller is clearly one of the blue chip vineyards in the northern Willamette Valley. In my experience, Stoller tends to produce a strongly black cherry flavored wine, soft and round with lower acid than the local norm. I'm usually looking for more tension and structure in a pinot noir, and it's no surprise that I love this 2007 Stoller Vineyard Pinot Noir JV (for jeunes vignes or junior (young) vines). This is their entry level wine, with a suggested retail of $25. Wonder what the fancy stuff from 2007 tastes like? Simply put, this is nice Oregon pinot noir. There's an intriguing black cherry, herb and toast perfume that marries nicely with dinner over a few nights. The flavors are similar, with a wet earth component to balance out the sweet fruit. This isn't acidic wine (pH is 3.84), but the whole thing seems a bit nervy and lively despite the chemistry. It's not cocktail pinot noir, and I can imagine that it's not big and rich enough for some tasters. That's what I love here. The wine trades size for interest, huge fruit for complexity, and it's delicious. What more do you want? Most importantly, you might find this at a good price on a restaurant wine list in some far flung places, where finding good and authentic tasting Oregon pinot can sometimes be a challenge. Order it without hesitation. There hasn't been much to report lately, though I suppose there a bunch of little things working mentioning. First, sort of big news from the Alcohol and Tobacco Tax and Trade Bureau, the federal organization better known as the TTB that licenses wineries and anyone else in the sin business. Yes, I received my TTB Basic Permit, required to sell my wine and the first domino in several at the state and local level to finalize all my licensing. Now all I need is approval for my City of Portland liquor license and the OLCC, our Oregon state overseers, should relent and approve me. Once that's done, I'll start hitting everyone up to buy my wine. Until then, get on my email list. Ha. Meanwhile, I'm working on a side project where some partners and I will bottle and sell less expensive wines. I wish I could write more about all that, but for now know that I'm working on more than just my own boutique Pinot noir label. There are plans afoot. There's good progress on my Pinot noir label design. I have a meeting later this week with my designer Angie Reat of Imprint Design. Angie's been great. I can't recommend her highly enough. We're down to two general concepts and with the next round of refinements, I think we'll be close to having our label. By June I want that done and graphics to put onto a new web site and email template. And business cards and everything else you can imagine. All that leads me to the future of this blog and how it will work with my emerging winery website. I'm setting up my own domain name, so my web "address" will change, that's for sure. However, do I go with a web hosting service, or do I simply do a Wordpress blog that can essentially serve as my winery website. More and more people I'm talking to suggest doing that. Upside is simplicity and I like Wordpress a lot. Downside is that there may be limitations I don't know about or appreciate at this point. Also, I want an email platform with good analytics and I think I can get that in a package with a more traditional web hosting service like Squarespace. So what's better, what's simpler, what's better value for the money I will end up spending? If any readers have ideas, I'd love to hear them. One thing I want to keep doing is blogging about what got me into all this craziness in the first place -- my interest in wine and what it teaches me. To that end, I'm really excited about writing a piece for Cory Cartwright's saignée blog for next month's 32 Days of Natural Wine. Past participants include Alice Feiring, Joe Dressner, Peter Liem and beautiful photo posts from Detroit's Putnam Weekly. This year may include all those and people like winemaker Eric Texier and Art of Eating author Edward Behr. What a tremendous idea Cory and I'm lucky to be able to participate. Now what should I write about? At least I have a few weeks to ruminate. 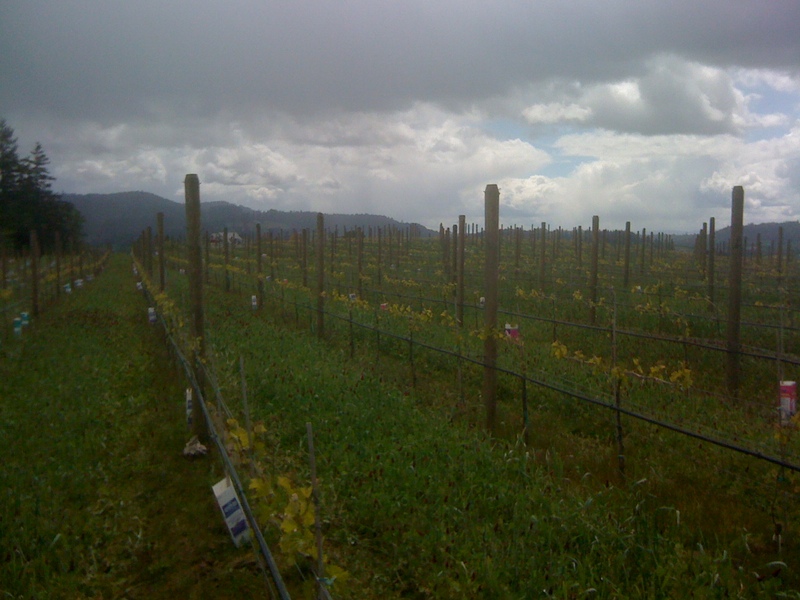 For 2010, Vincent Wine Company plans to source pinot noir grapes from two vineyards. One is the Zenith vineyard, which I've worked with for the previous two years. I'll write about that site soon enough. 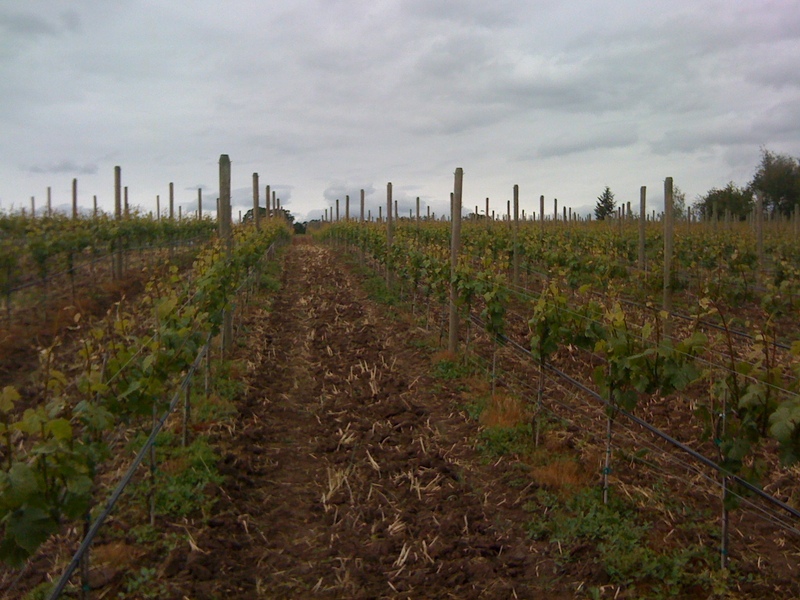 Today's focus is the Armstrong vineyard, a new site in the smallest of the Willamette Valley's AVAs, Ribbon Ridge. Here's a map of the region new published by the Oregon Wine Board and the Map Store. Armstrong is in D11 quadrant. Armstrong is owned by Doug and Michele Ackerman, longtime wine friends who purchased and planted nearly 15 acres of a neighboring horse farm in 2007. The vineyard is on Lewis Rogers Lane, just below Ayres and Brick House. I was working harvest in the area that fall and watched the land being prepped and planted each day as I went back and forth to Portland. I remember thinking how great it would be to somehow purchase grapes from the site for my own project, just a dream then. How perhaps this could be a site I worked with for many years. 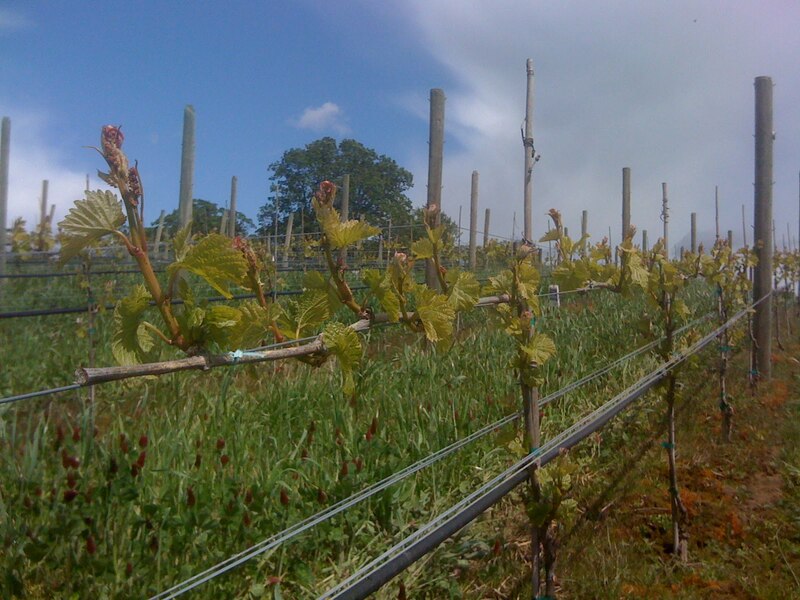 Now in 2010, the vineyard will produce its first commercial crop of grapes. To this point, the farming goals have been to grow roots and strong vine trunks. 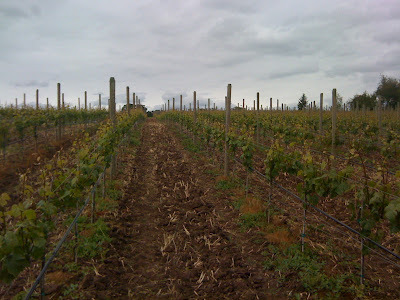 Now, the trellis wires will be raised and the vines allowed to produce a full canopy and a modest crop. I and two other producers, Ayres and Seven of Hearts, will split the anticipated 12 tons of grapes three ways this year, with more buyers likely in future years as the vines continute to mature and larger crops can be expected. Doug worked with us to divide up the blocks this year, and I'll be getting approximately equal amounts of pinot noir clones 115, 667 and 777 from various sections of the vineyard. The idea is to have enough of each to ferment them separately to assess each, then likely blend into one wine. We'll see. Perhaps there will be more than one wine here? Recently I stopped by the vineyard to check out the early growth and I managed to take some barely decent pictures with my phone. I must do better, but for now here's what I have. 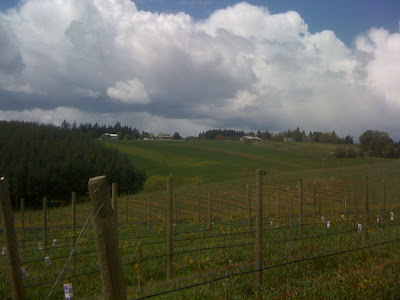 This view is from the 777 block at the northeast corner the vineyard, looking due south. This area is flat as you can see, but the vineyard slopes to the south just beyond our perspective here. In the distance, notice the back of the Dundee Hills. Just over the ridge is Domaine Drouhin and its neighbors. From a few rows over, still in the 777 block, Here a view back to the northwest to the 667 block. In between there's a swale where the gravel road from Lewis Rogers Lane comes up to the vineyard barn. Notice in the distance a nice looking chunk of unplanted land. I've heard people breezily suggest that all the plantable land in Yamhill County is pretty much taken. Uh, no. It might not be cheap any more, but there are several empty spots where I'm sure grapes would thrive. Because of some rain showers, I didn't make down to the 115 block on the south end of the vineyard. Instead, I headed over to the 667 hill. Here's a shot from the top looking down to Lewis Rogers Lane with the Yamhill-Carlton District in the distance. As with most pictures, you don't get quite a sense of how steep the slope is. So what was I looking for in this vineyard? A few things. One, there are some replantings happening where original vines didn't take. Replants are anywhere you see milk cartons, which protect the tiny new vines. Two, I wanted to see how uniform the new growth is. To my slightly trained eye, things looked really good. And I wanted to see how much growth there had been since my last visit two weeks ago. One of my goals this year is to visit the vineyard a lot and gain more knowledge of how the vines progress through the season. I'm no farmer, so I have lots to learn on this end. Here is a shot of a particularly strong vine in the 667 block, which seemed the most advanced area of the vineyard that I saw. If you look closely, you can see the primordial grape clusters already emerging. 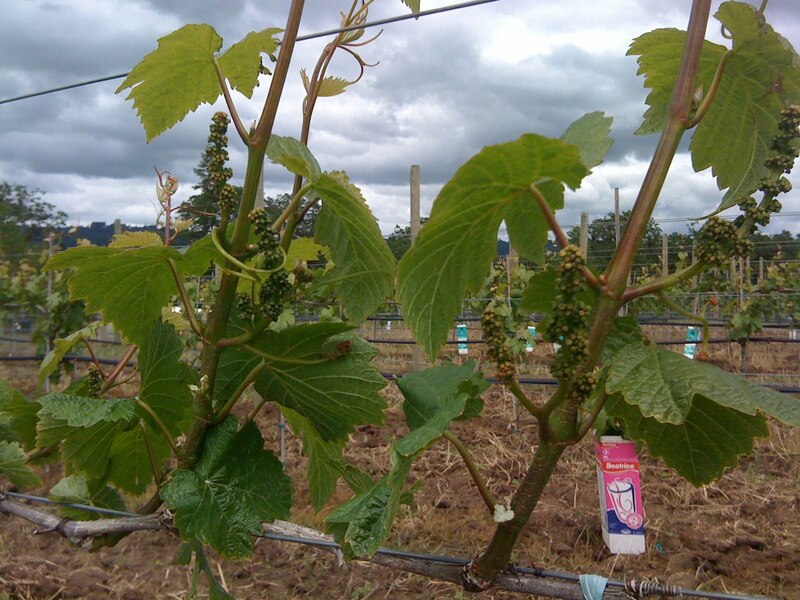 These clusters will flower sometime in June, to begin the fruiting phase of the growing season. So, what's growing in between the vine rows? 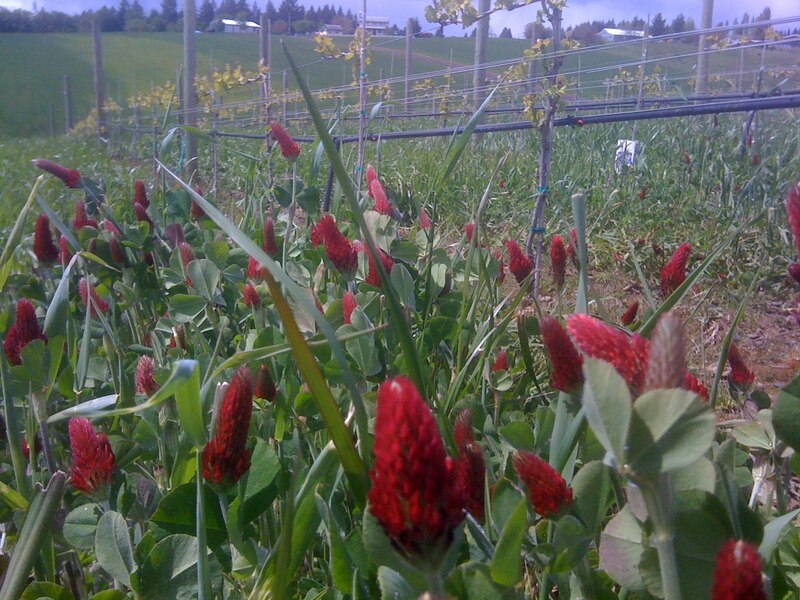 Lots of beautiful cover crop, which is plowed under to provide green manure for the vines, but perhaps more importantly serves as competition for the vine roots, forcing them down into the soil rather than faning out on the surface. Deeper roots are better, we'll just leave it at that. Regular readers should know my story by now. I've been a home winemaker for several years in Portland, OR, but with the 2009 vintage I'm starting a commercial label for my Oregon pinot noir. Along the way I've worked several harvests in commercial wineries and devoted myself to making commercial quality wine at home, in part to enjoy the product and get feedback from family, friends and even blog readers, in part to prove to myself I could make good wine consistently. I'm happy to report success on all fronts. Yes, you can come! You can even bring friends. All I ask is that you let me know you're coming and I'll give you my address and answer any other questions you have. We've had dozens of people at past tastings and it's fun to see old friends, newer friends, friends of friends, even complete strangers who read the blog and get up the gumption to email me and show up, all to taste wine and have some fun. This year I'll be pouring my recently bottled 2008 Vincent Pinot Noir Zenith Vineyard. I'm very happy with the wine and think you'll like it. It's a great way to close out my home winemaking career before the 2009s and beyond hit local store shelves and restaurants. There will be a sneak preview of those '09s. As usual, I'll open a few other fun things including some bubbly to make sure we've properly festive. I think it might make sense to revisit the 2006 Vincent Pinot Noir Wahle Vineyard from magnum to see how that's aging. In the meantime, come on down for the swan song garage tasting. Come into the garage through the out door, let your presence be felt. It's sure to be a celebration day, friends. Thank you.